Before going straight to coding, I had to prepare a few things. A working compilation of OpenCV - not trivial with the new version 2.0. Compiling OpenCV 2.0 proved to be a bit tricky. Even though the sourceforge project offers binary release for Win32, I compiled the whole thing from source. It turned out the binary release doesn't contain .lib files, and anyway has compatibility issues between MS VS 2005 and 2008 - something about the embedded manifest [google]. I downloaded the freshest source from SVN, and compiled it, but it didn't solve the debug-release problem, so I was left with using the release dlls even for debug evironment. Initially I thought I'll try an uncalibrated camera approach, but soon abandoned it. I had to calibrate my cameras, which I did very easily using OpenCV's "calibration.cpp", which strangely is not built when building all examples - it has to be built manually. But everything went smoothly, and I soon got a calibration matrix (focal length, center of projection) and radial distortion coefficients. For the test data I wanted to get a few views of a planar scene, where the first two views are separated only by a translation of ~5cm, as K&M do in the PTAM article. This known translation is helpful when trying to triangulate the initial features in the scene. When you have prior knowledge of where the cameras are, you can simply intersect the epipolar lines between the two views and recover the 3D position of the points - up to a scale. Keep in mind you must also have feature correspondence: a point on image A must be correlated to a point in image B. To achieve this I set up a small program that uses Optical Flow to track some 2D features in the scene, and grab a few screens + feature vectors. See 'capture_data.cpp'. I would like to triangulate the features. This is possible, as I discussed earlier, since I know the rotation (none), translation (5cm on -x axis) and camera calibration parameters (focal length, center of projection). Mat pts1M(_points), pts2M(_points); //very easy in OpenCV 2.0 to convert vector<> to Mat. OK, now that I have (hopefully) triangulated 3D features from the initial state: 2 views of a planar scene with 5cm translation on the X axis - I can move on the pose estimation. Theoretically, if I know the 3D position of features in the world and their respective 2D position in the image, it should be easy to recover the position of the camera, because there are a rotation matrix and translation vector that define this transformation. 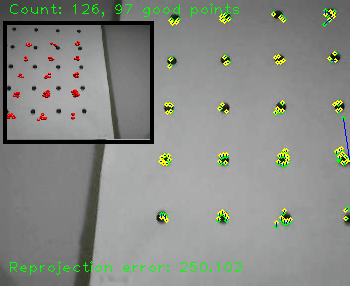 Practically in OpenCV, finding the position of an object using 3D-2D correlation is done by using the solvePnP() [link] function. Since I have an initial guess of the rotation and translation - from the first 2 frames - I can "help" the function estimate the new ones. After getting the extrinsic parameters of the camera, the next step is plugging in the visualization! It's basically what you do in augmented reality, you align the virtual camera's position and rotation with the results you get from the vision part of the system. In the pose estimation we ended with a 3D rotation vector (Rodrigues form) and 3D translation vector which is used as-is, so only the rotation vector should be converted to 3x3 matrix using the Rodrigues() function. This pretty much coveres my work, in a very concise way. The complete source code will reveal all I have done, and will provide a better copy-and-paste ground for your own projects. Initially I tried to implement a very crucial part of the PTAM work - pairing the 3D map with 2D features in the image. This allows them to re-align the map in every frame (when the tracking is bad) so the pose estimation does not "loose grip". In essence, they keep a visual identity for each map feature, very similar to a descriptor like SURF or SIFT, so at any point they can find where in the new image are the features and recover the camera pose from the 2D-3D correspondence. I ran into a problem utilizing OpenCV's SURF functionality, it seems to have a bug when trying to compute the descriptor for user-given feature points. Another thing I chose not to implement is creating a full map of the surroundings. I wanted to achieve a simple working solution for a small map (essentially a single frame), and see how it works. In the original work by K&M they constantly add more and more features to the map untill it has covered the whole surrounding room. To get the stereo initialization you must press [spacebar] twice: Once when the camera has stabilized and the features are stable, and another time when the camera has translated and again stabilized. This marks the 2 keyframes that will be used for stereo init and triangulation. From that point on, the 3D scene will start and the track-and-estimate stage begins. Try not to move the camera violently as the optical flow may suffer. Thanks Lior for your help getting the hang of these subjects, and the opportunity to meddle with a subject I long gone wanted to explore. I hope everyone will enjoy and learn from my enjoyment and learning.